Schedule for your fantasy week of Cubs baseball! appetizers, wine, beer, soft drinks. Introduction of the pros and team assignments. 10:30 – Intra-squad game! Play ball! 5:30pm, Camp barbecue on the concourse overlooking Sloan Park – family and friends invited! Final intrasquad games and championship play! 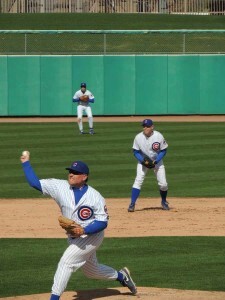 10:30 Cubs Campers vs. the Pros at the Cubs Spring training stadium – Sloan Park! Free time around the pool. Head home with memories to last a lifetime!